User is unable to make any changes to an existing CODESOFT label template. CODESOFT is open as read-only. This option, when selected, will make CODESOFT open all label file in a Read-Only mode. This mechanism can be used to prevent accidental changes to the labels. To verify this setting, Select Configuration from CODESOFT menu Tools. 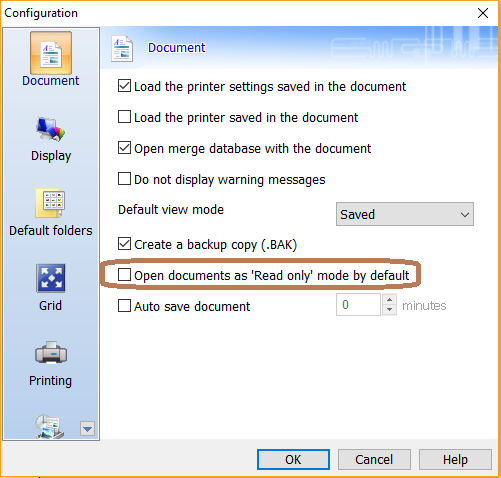 In the Configuration window, verify that the “Open documents as ‘Read only‘ mode by default” is not checked. The version of CODESOFT is a print-only version. To verify that this is or is not the case, Select Help / About from the CODESOFT menu and inspect the license type in the Installed Product section. 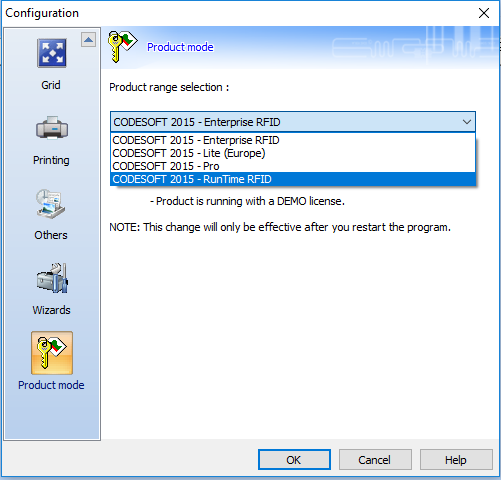 CODESOFT, purchased as Enterprise or Pro, can be set to Print Only or RunTime using the Product Mode feature of the software configuration. If the Product Mode is set to ‘CODESOFT XXXX – RunTime RFID’, the software will act as a RunTime edition. Just as described above, when in RunTime product mode, an instance of CODESOFT will not allow editing. Parts or all of the objects in the label are locked. 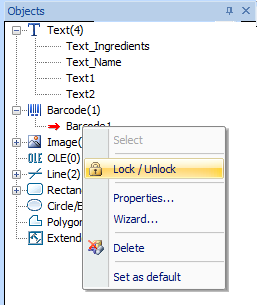 In CODESOFT (Enterprise version only), there is a way to lock objects in the label to prevent accidental changes or movement. This is done by selecting the object and click on the Lock/Unlock icon on the tool bar. 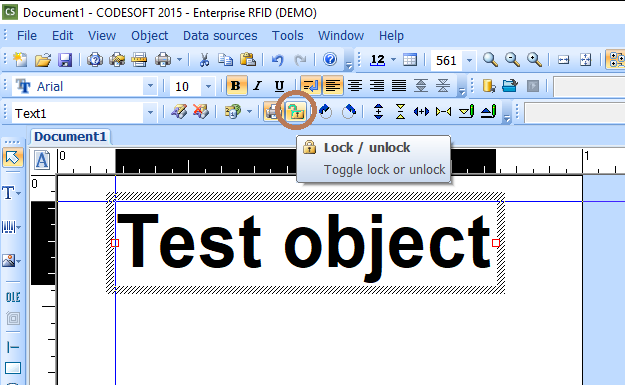 If the object is locked, the Lock/Unlock icon on the toolbar will show a locked position. If every object in the label is locked, the label will effectively becomes read-only. Note: The Lock/Unlock feature is only available in the Enterprise edition of CODESOFT. If your organization has a mix of Pro and Enterprise version, locking and unlocking of objects in a label can only be done (and visible) in the Enterprise version. #1. CODEOSFT is set to open files in ‘Read only’ mode – uncheck the “Open documents in ‘Read only’ mode by default” checkbox in the Documents tab of the Configuration screen in CODESOFT (Tools / Configuration / Documents). #2. 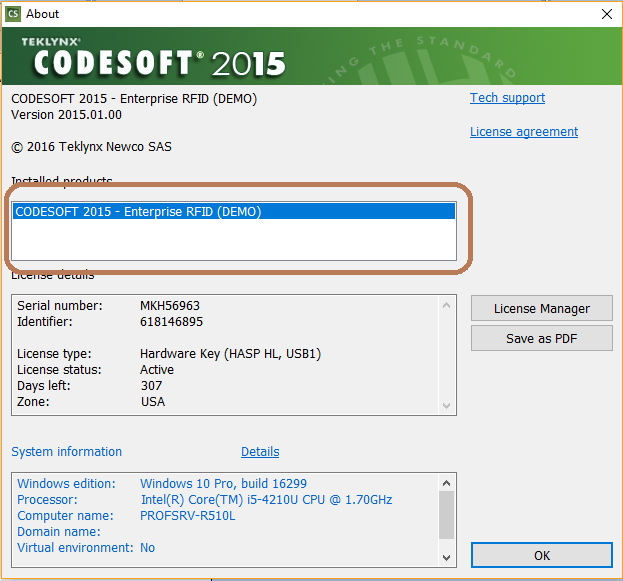 CODESOFT license is the Print Only edition – order a CODESOFT Pro or Enterprise license. Both of these editions allow for editing capability. #3. Product Mode set to Print Only edition – Select either Pro or Enterprise for Product Mode in the Product Mode tab of the Configuration screen. (Tools / Configuration / Product Mode). CODESFTO will need to be restarted for the Product Mode change to take effect. Select the field where change is needed and click on the “Lock / unlock” icon to unlock.